This Lucid 10 Inch Latex Foam Mattress Review was completed by the MattressJunkie.com team this week. 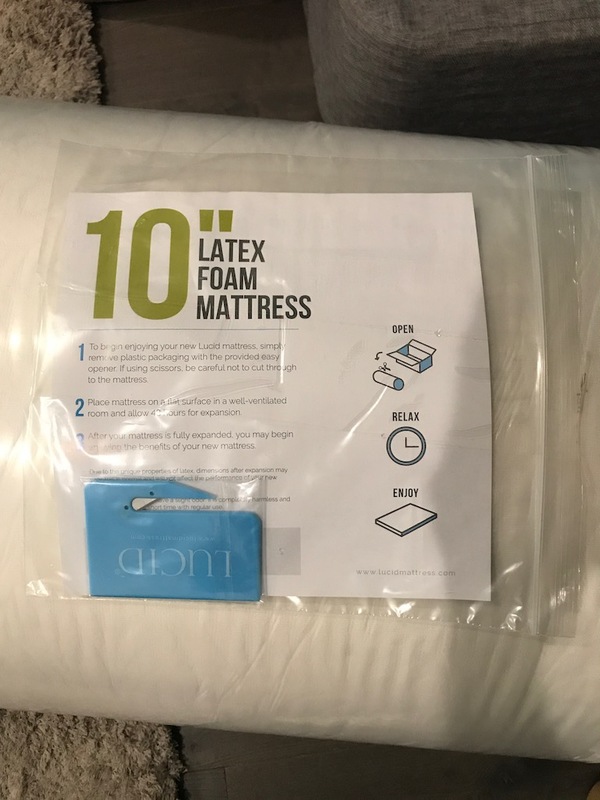 Lucid sent over a queen, 10 inch latex foam mattress for the review. This mattress sells for $419.99 online. 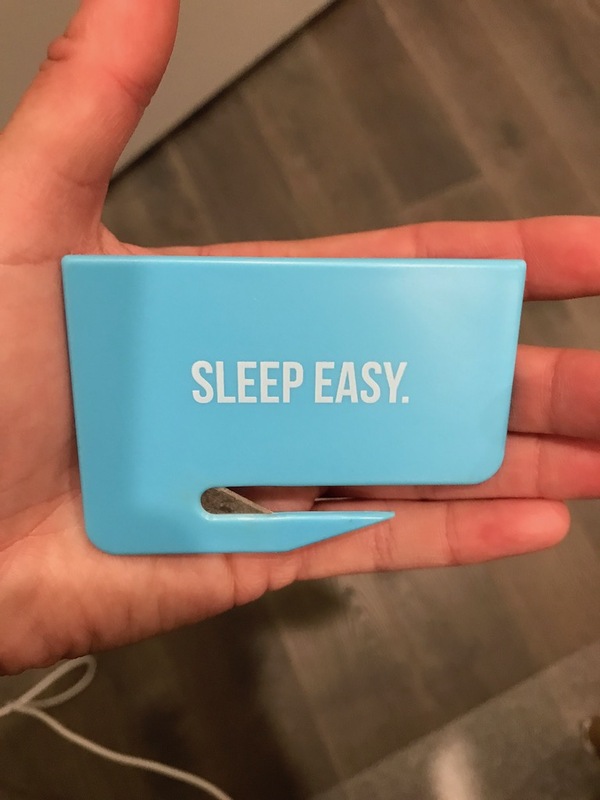 Lucid has an array of high quality sleep products that they sell. Lucid also is priced very reasonable compared to today’s market. From the products I have reviewed, the quality has been impressive. Read more below about the Lucid 10 Inch Latex Foam Mattress. 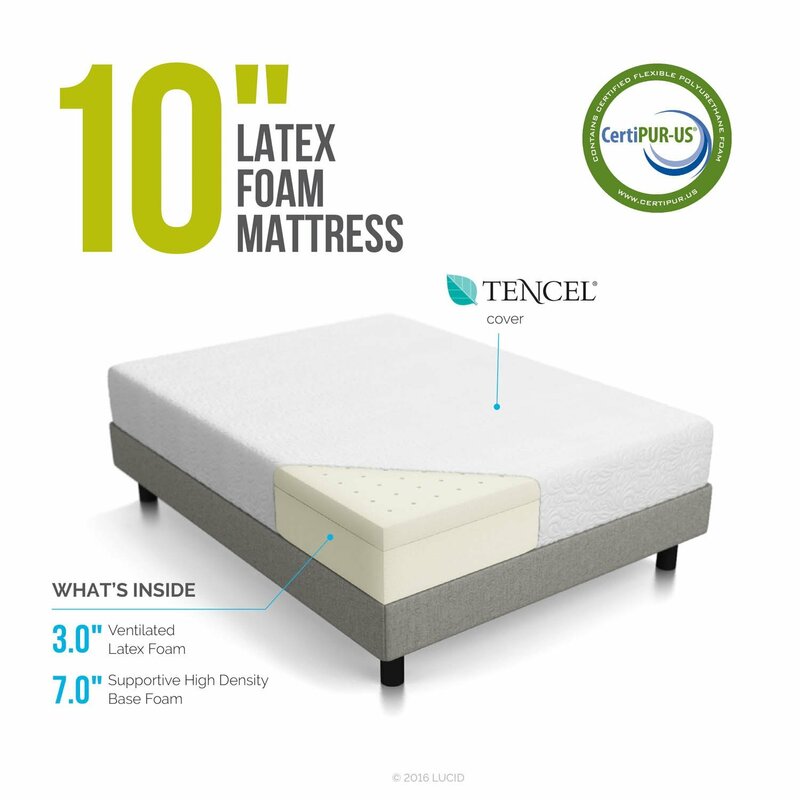 The Lucid 10 Inch Latex Foam Mattress cover is a Tencel blend. Tencel makes up 10% of the cover while polyester makes up 90%. The cover is white and has a nice hug on the mattress. 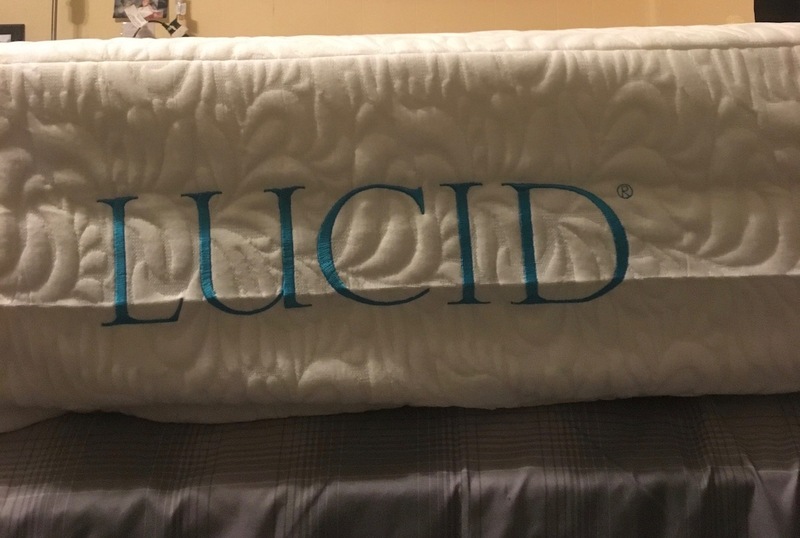 The cover has less stretch than the 12 inch memory foam mattress we reviewed by Lucid but it performed very similar in regards to breathing/staying cool throughout the sleep sessions. The Lucid 10 Inch Latex Foam Mattress has two layers under the cover. The first layer is made up of 3 inches of ventilated latex foam. Latex is preferred by some sleepers over memory foam for several reasons. Latex does not retain heat and provides a more responsive and spring like bounce vs. memory foam. Latex mattresses are more resiliant sleep surface. When sleeping on latex, you feel like you are sleeping on top on the mattress and not in the mattress as you feel with memory foam. Latex is also more durable so latex mattresses should have a longer lifespan than you would get with a memory foam option. Lucid 10 Inch Latex Foam Mattress is ventilated with holes throughout the latex 3 inch layer. This adds another cooling benefit to the sleeper’s experience. The second layer is 7 inches of high density support base foam. The support foam serves as the base of the mattress. High density base foam is integral to the mattress lifespan and comfort. Lucid 10 Inch Latex Foam Mattress is 30% latex foam rubber and 70% polyeurethane foam. Lucid 10 Inch Latex Foam Mattress is a medium firm. The mattresses is on the firmer side of medium due to the latex composition. For those that like a firmer sleep surface, you would like this mattress. Lucid 10 Inch Latex Foam Mattress is not too firm though so they did a great job of balancing comfort and support. 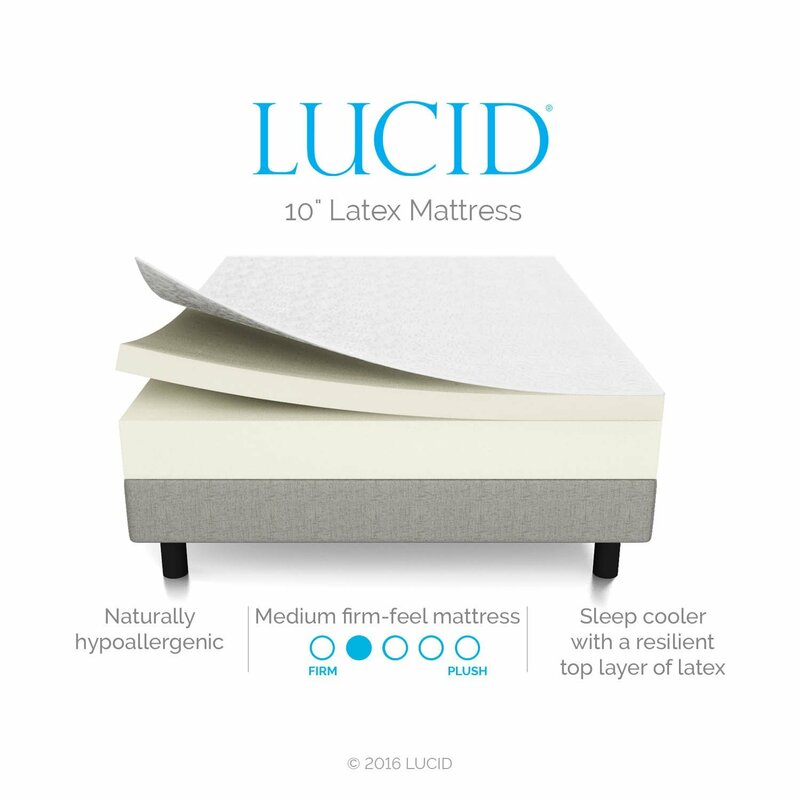 What Sleep Position Works Best with The Lucid 10 Inch Latex Foam Mattress? With latex being a more resiliant surface, back and stomach sleepers would work great with this mattress. Side sleepers that like a firmer surface would also find this mattress very comfortable. How is the Edge Support on the Lucid 10 Inch Latex Foam Mattress? Edge support on the Lucid 10 Inch Latex Foam Mattress was not an issue for me. I don’t use the edge as much as some may but sleeping close to the edge was no issue and neither was sitting on the edge. With memory foam, you sometimes get the feeling the mattress is giving in with you. The latex is firmer so you get a stronger edge. What type of base should I place my Lucid 10 Inch Latex Foam Mattress on? As you can see from the photos, we reviewed the Lucid mattress on a platform bed. Lucid recommends sleeping any firm, flat surface such as a box spring, platform bed, or floor. Will Lucid have a chemical smell when taken out of the box? Most mattresses have an odor to them when you unroll and remove the vacuum sealed plastic. This chemical type smell is called off-gassing. Off gassing is not harmful nor toxic in any way. As your mattress breathes, the off-gassing smell will fade. While memory foam mattresses always have a smell for a timeframe, latex does not have much of a smell. This was not noticeable at all with the Lucid 10 Inch Latex Foam Mattress. 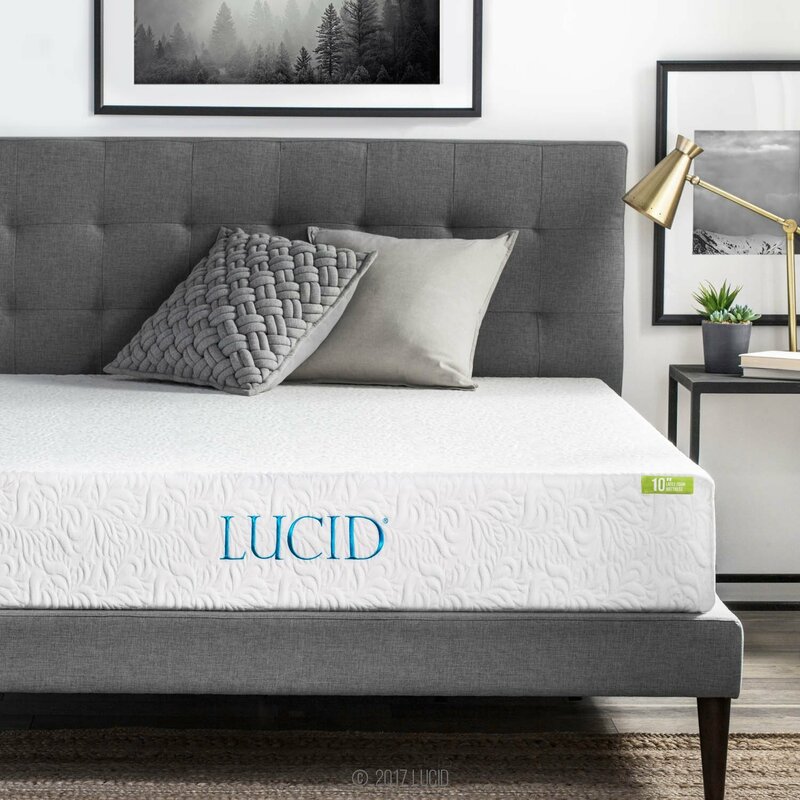 Yes, the Lucid 10 Inch Latex Foam Mattress is made from high quality materials that are Certipur-US Certified so you and the environment are safe from any harmful toxins. 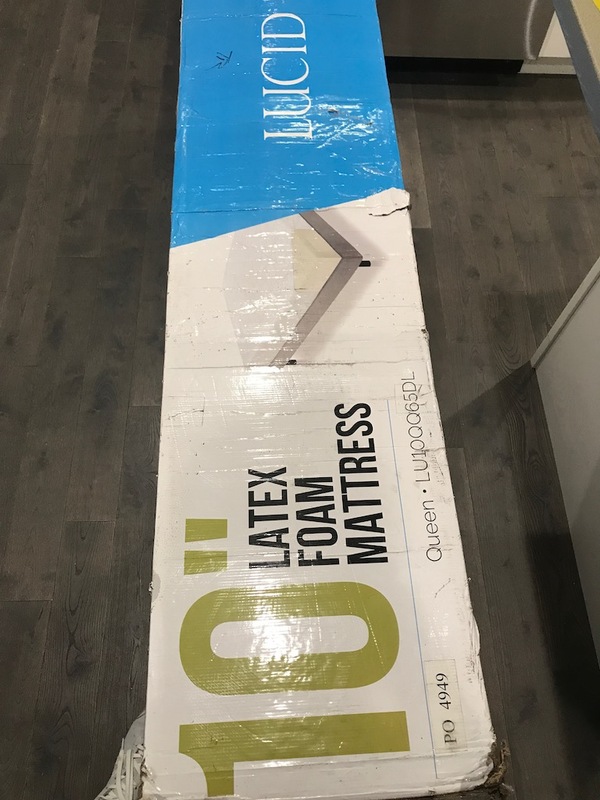 How much does the Lucid 10 Inch Latex Foam Mattress cost?